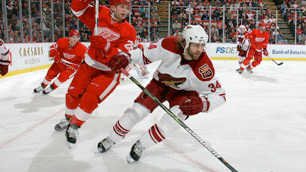 GLENDALE -- The Coyotes are preparing for their first trip to the Stanley Cup Playoffs in eight years. For eight players on the roster, it will be their first taste of the NHL’s postseason. But instead of being nervous about Wednesday’s first game against the Detroit Red Wings, all of them are looking forward to the experience. Forward Daniel Winnik also expressed those feelings. Hanzal says that some of the team’s veterans have talked to some of the younger players about what to expect in the playoffs. Defenseman Keith Yandle said that some of the veterans have given him some insight into what playing in the postseason is like. Hanzal says that getting a chance to play in the playoffs means a little bit more to the team’s homegrown players who have been through the recent ups and the downs of the organization. 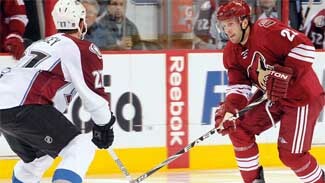 Forward Lee Stempniak has played in 374 NHL regular-season games, but he has never played in a postseason game. He says that he’s been waiting for this moment for a long time. As far as what some of the playoff first-timers need to do against Detroit, Winnik says that their game needs to be simple. Yandle says that he is going to keep playing as aggressively as he did during the regular season. Paul Bissonnette, Martin Hanzal, Sami Lepisto, Zbynek Michalek, Lee Stempniak, Viktor Tikhonov, Daniel Winnik, Keith Yandle.